The biggest resource for finding food (and entertainment!) in Madison is probably the [http://www.thedailypage.com/eats/ Daily Page] (the online version of our local paper, the Isthmus), where you can search local restaurants by name, locality, and cuisine. There, they have reviews, hours, contact info, pricing, etc. Be sure to peruse their [http://www.thedailypage.com/mad-tools/madisons-favorites/favorites.php?category=Restaurants Madison's Favorites] section for some quick tips! The biggest resource for finding food (and entertainment!) in Madison is probably the [http://www.thedailypage.com/eats/ Daily Page] (the online version of our local paper, the Isthmus), where you can search local restaurants by name, locality, and cuisine. There, they have reviews, hours, contact info, pricing, etc. Be sure to peruse their [http://www.thedailypage.com/mad-tools/madisons-favorites/favorites.php?category=Restaurants Madison's Favorites] section for some quick tips! Of course [http://www.yelp.com/ yelp] is always useful as well. At one point a couple spent a few years trying to sample every restaurant in Madison and blogged about their journey on the [http://www.madisonatoz.com/ Madison A to Z]. *Food Carts: Open for lunch in Library Mall at the foot of Bascom Hill near Lake & State Street. Very good and very cheap, and out as long as it's not too cold. *Ingraham Hall: Not as good and not as cheap, but very close to Van Vleck, and has acceptable coffee (bring your own cup to save money!) and decent snacks. Try the lunch special: sandwich and 4 sides (soda, fruit, cookies, etc.) for five bucks. *Badger Market at Ingraham Hall: Very close to Van Vleck, and has acceptable coffee (bring your own cup to save money!) and decent snacks. Try the Badger Bundle lunch special: sandwich, drink, and a side for $1 off your total. Halfway down the hill is the [http://www.union.wisc.edu/crossroadscafe.htm Crossroads Cafe] which has much better coffee and is open later. *Memorial Union: The Rathskeller has food and next door is Lakeside cafe with much better food. Summer afternoons on the terrace is an excellent place to hang out in the sunshine with a beer and brat. *Union South: Features a pizza place, a pan-Asian restaurant, a sandwich shop, a sports bar (burgers and sandwiches) and an ice cream stand. *State Street (past the food carts) is full of restaurants and Coffee shops – there are at least a half dozen coffee roasters in town, and each supplies a different set of shops. In particular for lunch, there are the popular chains, such as Potbelly Sandwich Works, Einstein Bros. Bagels, or Chipotle... or hit the more independent spots such as the Sunroom Cafe or Ian's Pizza. *Residence Hall Cafeterias are pretty decent here, but filled with undergraduates! Enter at your own risk! The local foods are beer, ice cream, cheese, and brats (say hello to your new-found Wisconsin-love-handles). Each year Madison hosts [http://www.bratfest.com/ Bratfest], a record breaking event. UW has [http://www.wisc.edu/foodsci/store/ Babcock Hall Ice Cream] on campus which creates delicious ice cream available in the Unions. Other great local places to hit are the [http://www.chocolateshoppeicecream.com/ Chocolate Shoppe] (which has also experimented with soy creams) and [http://www.ilovemichaels.com/ Michael's Frozen Custard]. Local breweries include the [http://www.greatdanepub.com/ Great Dane], [http://www.capital-brewery.com/ Captial Brewery] and [http://www.aleasylum.com/ Ale Asylum]. You could also take a trip out to the [http://www.newglarusbrewing.com/ New Glarus Brewing Co]-- camp out in the [http://www.dnr.state.wi.us/ORG/LAND/parks/specific/ngwoods/ New Glarus Woods State Park] and take the tour of the brewery while you're there. In early September (2nd-3rd), check out [http://www.madisonfestivals.com/taste/ Taste of Madison] to see many restaurants all in one place at one time. Traditional Madison foods are German varieties such as beer, cheese, and bratwurst. Twice a year Madison hosts [http://www.bratfest.com/ Bratfest], a record breaking event. UW has [http://babcockhalldairystore.wisc.edu/ Babcock Hall Ice Cream] on campus which creates delicious ice cream available in the Unions. The [http://www.chocolateshoppeicecream.com/ Chocolate Shoppe], [http://www.ilovemichaels.com/ Michael's Frozen Custard] and [http://www.culvers.com/ Culvers] have nice deserts. Micro breweries in town include the [http://www.greatdanepub.com/ Great Dane], [http://www.capital-brewery.com/ Captial Brewery] and [http://www.aleasylum.com/ Ale Asylum]. Nearby there is the famous [http://www.newglarusbrewing.com/ New Glarus Brewing Co] which only sells beer in Wisconsin. You can join a free beer tour or walk through the brewery on a self guided tourn. Try a good ol' midwestern Fish Fry on Friday night – All you can eat fried fish generally served with a bran muffin, clam chowder, or coleslaw. Most Brew Pubs and some churches have them, and the [http://www.orpheumtheatre.net/restaurant.php Orpheum] has a particularly tasty fry. In early September (Labor Day weekend), check out [http://www.tasteofmadison.com/ Taste of Madison] to see many restaurants all in one place at one time. Try a good ol' midwestern Fish Fry on Friday night – All you can eat fried fish generally served with a bran muffin, clam chowder, or coleslaw. Most Brew Pubs and some churches have them, and the [http://www.avenuebarmadison.com/ Avenue Club] runs a Friday night Fish Fry. The [http://www.madfarmmkt.org/ Dane County Farmer's Market] is amazing and HUGE. The big one is open every Saturday morning, and is located on the capitol square for most of the year. In addition to the ludicrous amount of fresh produce, there are also bakery stands, coffee, and fresh juice carts for quick breakfasts. The [http://madisonfarmersmarket.com/ Dane County Farmer's Market] is amazing and HUGE. The big one is open every Saturday morning, and is located on the capitol square for most of the year. In addition to the ludicrous amount of fresh produce, there are also bakery stands, coffee, and fresh juice carts for quick breakfasts. *Saturday: 6am to 2pm on the Capitol square, 7am to 1pm at the Hilldale Shopping Center, 9am to 2pm at 1602 S. Park St, 7am to 1pm at Sheboygan Ave. and Segoe Rd., and 8:30am to 11am in Watertower Park. During the summer and fall, you can wander out to one of the many [http://www.reapfoodgroup.org/atlas/index.htm local farms]. Grab some friends and drag them along to a [http://www.reapfoodgroup.org/atlas/farms/u_pick.htm U-Pick] farm while strawberries, raspberries, apples, or pumpkins are in season -- the distance can detract, but the produce is much cheaper when you pick it yourself. During the summer and fall, there are many [http://www.reapfoodgroup.org/atlas/index.htm local farms] where you can [http://www.reapfoodgroup.org/atlas/farms/u_pick.htm pick] your own strawberries, raspberries, apples, or pumpkins when they are in season. If you're in town for the summer, you might consider signing up for a [http://www.macsac.org/ Community Supported Agriculture] food box. CSA is a way to support a local farm by paying an annual fee in the winter or spring which buys you a share of the season's harvest. Once harvesting begins, members pick-up a weekly box of fresh foods which may include produce, fruits, cheeses, eggs, meats, poultry, flowers, herbs or preserves. The typical CSA season in Wisconsin runs from the end of May through mid-October. You do have to pay the lump sum up-front, and some weeks you'll find yourself with five pounds of chard... but for most of the summer you'll have your produce needs met, and you can feel good about supporting small local farms. Better yet, most of the university's insurance providers offer [http://www.macsac.org/rebates.html rebates] for signing up for a CSA -- somewhere between $50-$300, depending on the plan and how many people you're sharing with (for example, if two people on GHC share a box, they might pay $450 for the box for a box lasting 25 weeks, but they they could each get $100 back, making that $5/week per person). If you're interested, remember to sign up early -- most programs are full by May. *[http://www.aldifoods.com/ Aldi Foods]: CostCo-esque in inventory and pricing, but not restricted to bulk items. It's like grocery shopping at Overstock.com. *[http://www.capcentrefoods.com/home.html Capitol Centre Foods]: If live downtown and have no ride then try here. It's small and a little more expensive, but they deliver. *[http://www.capcentremarket.com/ Capitol Centre Market]: Given their small size, they have an excellent selection of groceries. They tend to be a bit pricey. In addition, they deliver groceries. *[http://www.freshmadisonmarket.com/ Fresh Madison Market]: A reasonably large general grocery store, not too expensive. Has a large selection of "typical college items" (lots of frozen foods). Located on University, not too far from Van Vleck. They also deliver groceries. *[http://www.copps.com/ Copps]: Your standard grocery store with multiple locations. *[http://www.costco.com/Warehouse/LocationTemplate.aspx?Warehouse=1020&lang=en-US CostCo]: A little out of the way, being in Middleton, but cheap. They sell stuff in bulk - three packs of mayonnaise, 50 oz bottles of shampoo, 17 lbs of sockeye salmon - you get the picture. You'll need a membership if you choose to shop there, though - about $50/year. *[http://www.google.com/maps?hl=en&client=firefox-a&q=cub+foods&near=Madison,+WI&ie=UTF8&z=12&ll=43.081176,-89.416695&spn=0.152461,0.304527&om=1 Cub Foods]: Family size packs of everything! *[http://www.wholefoods.com/stores/madison/ Whole Foods]: Kinda pricey, but good bread, specialty stuff, and produce through the winter. *[http://www.google.com/maps?f=l&q=walgreens&near=Madison,+WI&layer=&ie=UTF8&hl=en&z=12&ll=43.076412,-89.405022&spn=0.152473,0.304527&om=1 Walgreens]: Pharmacy/Grocery store. In a pinch, it will do (no produce though). There is a Walgreens on the corner of Lake & State Street near Van Vleck, and on the Capitol Square. *[http://www.woodmans-food.com/ Woodman's]: two locations -- [http://www.google.com/maps?f=q&hl=en&q=725+S+Gammon+Rd+Madison,+WI&ie=UTF8&om=1&ll=43.055217,-89.50304&spn=0.05381,0.171661 East] and [http://www.google.com/maps?f=q&hl=en&q=3817+Milwaukee+St,+Madison,+WI&ie=UTF8&ll=43.103615,-89.319363&spn=0.053768,0.171661&om=1 West]. If you have a car and the time, go here. Very large, very cheap, but time consuming. They don't take credit cards, so bring a debit card or check book. Check out the liquor store for a large selection (you can buy all types of alcohol in grocery stores in Wisconsin... but not after 9pm). *[http://www.traderjoes.com/ Trader Joe's]: Located at 1810 Monroe St. They have good prices for select specialty food items such as wine, cheese and fancy snacks. Their basic foodstuffs tend to be a bit pricey. *[http://www.wholefoods.com/stores/madison/ Woodman's]: two locations -- [http://www.google.com/maps?f=q&hl=en&q=725+S+Gammon+Rd+Madison,+WI&ie=UTF8&om=1&ll=43.055217,-89.50304&spn=0.05381,0.171661 East] and [http://www.google.com/maps?f=q&hl=en&q=3817+Milwaukee+St,+Madison,+WI&ie=UTF8&ll=43.103615,-89.319363&spn=0.053768,0.171661&om=1 West]. If you have a car and the time, go here. Very large, very cheap, but time consuming. They don't take credit cards, so bring a debit card or check book. The produce is pretty poor, but they're huge and, again, cheap. Check out the liquor store for a large selection (you can buy all types of alcohol in grocery stores in Wisconsin... but not after 9pm). *The Jenifer Street Market located on 2038 Jenifer Street is a nice little grocery store if you happen to live in the area. *[http://www.math.wisc.edu/wiki/skins/common/images/button_extlink.png Regent Market Cooperative], 2136 Regent St. 233-4329... a little off the beaten path, but goto if you're in the area. *[http://www.regentmarketcoop.org/ Regent Market Cooperative], 2136 Regent St. 233-4329. *[http://www.willystreet.coop/ Willy Street Co-op] The largest and most active co-op in the Madison area. If you like organic and fair trade foods, then this is the place to go. They also offer a large selection of bulk foods and spices, as well as fresh fish and deli meats. For a quick bite, they have a deli, salad bar, and in-store coffee shop. 1221 Williamson St. 251-6776. *[http://www.willystreet.coop/ Willy Street Co-op] The largest and most active co-op in the Madison area. They have been able to survive the decline in co-ops over the years. They offer a large selection of bulk foods and spices at an excellent price. For a quick bite, they have an excellent deli, salad bar, and in-store coffee shop. 1221 Williamson St. 251-6776. They recently opened a second store in Middleton located at 6825 University Ave. Both locations deliver groceries. *[http://www.aldifoods.com/ Aldi Foods]: Very cheap! Little selection. *[http://www.brennansmarket.com/ Brennan's Market]: Great for Produce, Meats, Cheese, Micro brews and Wines. You won't find things like Flour and Saran Wrap here, but definitely worth the trip. *[http://www.madfarmmkt.org/ Dane County Farmer's Market]: Not a grocery store, but definitely check this out! On the capitol square on Saturday mornings April–October from early to noon. Everything had to have been produced in Wisconsin. Great for meats, eggs, CHEESE, produce, breakfast, and just about anything you could ever want – except milk. Great place for Cheese curds! *[http://www.reapfoodgroup.org/atlas/ Farm Fresh Atlas]: Not a grocery store, but a good resource for where you can buy local foods and a list of farms in the areas. *[http://www.madseafood.com/ The Seafood Center]: The name says it all. Great fresh fish and live lobsters. *[http://frabonisdeli.com/ Fraboni's]: An awesome Italian grocery store and deli. They have very good [http://frabonisdeli.com/oils olive oils], [http://frabonisdeli.com/pastas pastas], and make-your-own pizza fixings. *[http://www.insiderpages.com/b/3723579948/garden-asian-market-middleton Garden Asian Market]: A full service Asian food market specializing in fresh meat, produce, and seafood. Mostly Chinese-leaning, they do a good job of providing a wide variety of items within their niche. It may be far out, but it's worth the trip in its pleasantness and selection. *[http://maps.google.com/maps?client=safari&oe=UTF-8&ie=UTF8&q=india+house+grocery+store,+madison,+wi&fb=1&gl=us&hq=india+house+grocery+store,&hnear=Madison,+WI&cid=0,0,8495347478199843118&ll=43.050466,-89.503019&spn=0.007871,0.019183&t=h&z=16&iwloc=A India House]: Really well done Indian grocery store. Good place to buy Kari leaves. *[http://www.traderjoes.com/ Trader Joe's]: A specialty grocery store originating in California, now located at 1810 Monroe St. Unlike most specialty stores, they do have many things that any grocery store would. Though they aren't exactly cheap, they do have much lower prices for what they provide than most other places. * [http://housing.civc.wisc.edu/UW Off-Campus Housing Search]: Probably the best search site for students. * [https://campusareahousing.wisc.edu/ UW Off-Campus Housing Search]: Probably the best search site for students. * Again, [http://madison.craigslist.org/ Craig's List] is a good resourse. Also a good place to look for roommates outside of the department. * [http://www.housing.wisc.edu/universityapartments/ University Apartments]: On campus graduate housing, particularly popular with married couples (especially with children). Singles are also welcome. Many of them are on the bus rout #80, a free route which runs from the apartments through campus every fifteen minutes throughout the day. * [https://www.housing.wisc.edu/apartments/ University Apartments]: On campus graduate housing, particularly popular with married couples (especially with children). Singles are also welcome. Many of them are on the bus route #80, a free route which runs from the apartments through campus every ten minutes throughout the day. Because there is no parking on campus, you will need to plan on living within walking distance of a bus route or campus itself. You will receive a free bus pass for the [http://www.cityofmadison.com/metro/ Madison Metro] system, which is very reliable. Check out the “plan your trip” link to find bus routes near you. Basically, shoot for zones 4 and 6 on this map (the map from the UW Off-Campus Housing Search). Biggest guideline: stay close to campus or a busline (don't plan to park on campus). You will receive a free bus pass for the [http://www.mymetrobus.com/ Madison Metro] system which is very reliable. Check out the “plan your trip” link to find bus routes near you. Basically, shoot for zones 2-6, the North parts of zones 7 and 8, or the far East part of zone 10 on [http://housing.civc.wisc.edu/map_all.asp this map] (the map from the UW Off-Campus Housing Search). The [http://www.tenantresourcecenter.org/ Tenant resource center] is a small non-profit membership organization which provides housing counseling, mediation services and office assistance. Their website includes tips for new renters, generic rental forms, and advice for what to do if your landlord just won't get back to you about repairs, returning deposits, etc. There is also the [http://studenttenantunion.rso.wisc.edu/ Student tenant union], which is specifically targeted to UW students. There is also the Student tenant union, which is specifically targeted to UW students. *[http://www.madisonproperty.com/ Madison Property Management]: Lots of choices, but notoriously junky properties. They tend to cater mostly to undergraduates, and their rentals show it. We wouldn't recommend renting from this company unless you visit first. *[http://www.mcbridecompanies.com/ The McBride Companies]: Nice properties, good management. Really good website if you turn the sound off. *[http://www.tallardapartments.com/ Tallard Apartments]: Nice properties with very friendly and responsive staff. Their rentals tend to go early in the season. *The Wright Company (or Norris Ct. Apartments): Very nice older buildings, but kind of sketchy management. Nothing is going to be in stellar shape, but they do tend to rent more to graduates and professionals, so they aren't beat up either. If you do rent from them, don't expect them to be very responsive, and be sure to be especially careful about protecting your security deposit by taking photos and keeping a record of your move-in report. 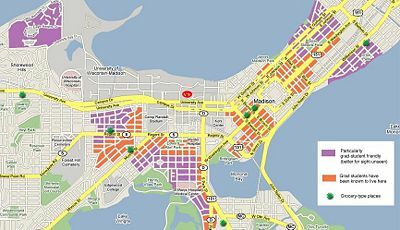 *[http://www.cityofmadison.com/bikeMadison/ Bike Madison] City of Madison Bike Map, Plan Your Ride, and more. *[http://www.cityofmadison.com/metro/ Madison Metro] Madison bus service. Students get a yearly bus pass as part of their segregated fees. Bus routes and schedules and Google Transit Planner. *[http://www.communitycar.com/ Community Car] is a Madison-based carsharing company that rents cars by the hour to individuals and organizations. Members share access to a fleet of gas efficient vehicles located in reserved parking spaces throughout the city. *[http://groups.yahoo.com/group/madisonfreecycle/ Freecycle]: A community "give stuff away for free" website with a Madison branch. *The Todd Drive Area: Just west of park street on the beltline. American Furniture for furniture and electronics, Home Concepts for cheap but nice looking furniture, and Steinhafel's for furniture and mattresses. *Hippie Christmas ("Move-Out Day"): For some reason or another, the evening of August 14th is when the bulk of leases near campus turn over. This is a fantastic day to pick up free furniture from the street. If you already have a rental van, why not help municipal waste by pickup up a bookshelf for them? *The Todd Drive Area: Just west of park street on the beltline. Home Concepts for cheap but nice looking furniture, and Steinhafel's for furniture and mattresses. *[http://www.bussvc.wisc.edu/swap/swap.html SWAP]. The UW's surplus supply store. *Goodwill, multiple locations all over the city. *[http://www.blackhawkchurch.org/ Blackhawk Evangelical Free Church]: Near Sheboygan Ave. at 110 N Whitney Way. A huge church, but with opportunities to get involved and meet people. It has services in the sanctuary, with a mixture of traditional and semi-modern worship, and also "video cafe" services with more lively, modern worship. Very good teaching. *[http://www.cpcmadison.com/ Christ Presbyterian Church]. Just east of James Madison Park on Gorham. Has a great choir and organist! *[http://www.fusmadison.org/ The First Unitarian Society of Madison]. "A liberal religious community that encourages individual spiritual growth and community action in an atmosphere of warmth, freedom of belief, intellectual curiosity, and open dialogue." Looking for something new? They're open to all types. Also, they are housed in a historic Frank Lloyd Wright building. *[http://genevacc.org/ The Geneva Campus Church]: On Campus Reformed church. They describe themselves as "a university church for the whole family"
*[http://www.uwhillel.org/ Hillel]: UW-Madison's on-campus center for everything Jewish: religious, cultural, political, traditional, and alternative. Located on Langdon Street, it serves both the school population and, to a far lesser extent, the entire city. *[http://ivgcf.rso.wisc.edu/ InterVarsity Grad Christian Fellowship]: It's a welcoming place for Christians and non-Christians alike. (You might even find your future husband/wife there) They also have a website with info about local churches. There is a new student picnic at the beginning of the fall semester. *Latter Day Saints: There are a number of Church of Jesus Christ of Latter-day Saints wards in the Madison area. The Madison First Ward covers areas closest to campus and meets at 4505 Regent Street, two blocks south of Hilldale Mall, at 9am. The University Ward serves single adults and meets at 1711 University Avenue at 10 am. The Madison Third Ward serves areas close to campus and meets at 701 Bear Claw Way on Madison's far west side at 11 am. Visitors and the curious are always welcome. *[http://www.lccmadison.com/ Lutheran Campus Center]: A fairly young, enthusiastic, and liberal-minded congragation, found right on campus. *[http://madcitychurch.org/ Mad City Church]: A non-denominational, casual christian fellowship. Services are held in the LaFollette High School located on Madison's east side - very near the corner of Pflaum Rd. and Monona Dr. Office at 2713 E. Washington Ave.
*[http://www.muuyacm.org/ Madison UU Young Adult and Campus Ministry (MUUYACM)]. One of the largest and most active Unitarian Universalist young adult groups in the U.S., they are open to young adults (ages 18-35) of all denominations. In addition to worships, they organize social-justice-oriented activities, and are an active member of the Wisconsin Network for Peace and Justice. *[http://www.uwcatholic.org/ St. Paul's University Catholic Center]: On campus in Library Mall near Lake & State. Has a lively Catholic grad student group called Mustard Seed with Bible studies, Thursday night speakers, retreats, service projects, and large quantities of food and euchre. *[http://www.unityofmadison.org/ Unity of Madison]: (from their site) "Unity of Madison is a heart-centered Spiritual Community focused on Truth Seeking and Spiritual Growth through the Christ Consciousness of Acceptance, Love, Peace and Joy. Our purpose is to inspire, nuture, and empower all people in their spiritual growth. We provide creative worship, joyful gathering and educational programs as we teach and live Jesus' message that 'the kingdom of God is within you.'" *[http://www.isthmuszencommunity.org/ Zen Buddhism]: A local zen buddhist center is located next to Willy st co-op. New comers are especially welcome. Capital Square every Saturday morning from April-October; and lots of other things. The [http://www.thedailypage.com Isthmus], is the local free newspaper which posts many current events. The Isthmus can be found in many stores, in campus buildings, and on street corners. * [http://www.recsports.wisc.edu/ Rec Sports] runs the gyms on campus. There are three such on-campus gyms -- The SERF, the Nat, and the Shell, which are free with student ID. For $25/semester, you can attend any of their Group Fitness classes, which cover everything from aerobics and weights to yoga and dance. Also, both the SERF and Nat have indoor pools. *The University of Wisconsin has a long standing heritage of being proud of their [http://www.uwbadgers.com/ athletic events]. Men's basketball, football and ice-hockey receive the most attention and as a student, you can obtain season tickets for all of these events. * [http://www.mufa.org MUFA] is an ultimate frisbee league that has summer as well as spring and fall seasons. This is a really fun way to stay active and meet some new Madison friends! You don't need to form a team-- just see the link for info about how to join a team looking for more players. Note: the games are often played all over the city and burbs, and are not necessarily reachable by bus. You'll need a car, or a teammate with a car. Also see the link for info about local pick-up games. *Ballroom: [http://www.uwmbda.org/ UWMBDA] is the big ballroom dance group here. They have dances with lessons every week on Friday or Saturday and a practice group every Thursday. *[http://sprott.physics.wisc.edu/dances.htm Contra Dance]: Meetings every Tuesday. *International Folk club: meets biweekly Library Mall, Wed/Sun 7:30PM-late. *Swing: [http://www.uwswing.com/ Jumptown Swing] is UW's swing club. They host (mostly) weekly dances at Union South, and provide lessons for a nominal fee. See their site for scheduling and links to other swing orgonizations. Also, on Wednesdays, there's dancing at the [http://www.thebrinklounge.com/ Brink Lounge] from 8-11. *Salsa: Venues include [http://www.cardinalbar.com/ Cardinal Bar] on Thursdays, [http://www.thedailypage.com/theguide/details.php?event=176610 Frida's] on Friday nights. Don't know how to Salsa? There are lessons before dances at Cardinal, and instruction is offered through the Union's minicourses. *Tango: the [http://www.madisontango.org/ Madison Tango Society] provides lessons and dances for Argentine Tango. Their site has a good list or other events in and around Madison. In addition to the many [http://www.library.wisc.edu/ Libraries of UW], the [http://www.madisonpubliclibrary.org/ Madison Public Library] is a great place for books, movies, and music. *[http://marcustheatres.com/Theatre/TheatreDetail/140/ Eastgate Cinema], [http://marcustheatres.com/Theatre/TheatreDetail/141/ Point Cinema] and [https://www.amctheatres.com/movie-theatres/amc-star-fitchburg-18 AMC (Star) Cinema] are the three larger movie theaters in town. *[http://www.silvercinemasinc.com/scshowtimes.aspx Market Square] shows second runs at a good discount. *The [http://www.orpheumtheatre.net/ Orpheum] is an old cinema within site of the capitol on State street. They tend to show less mainstream movies. *[http://www.sundancecinemas.com/madison.html Sundance 608] shows independent film as well as blockbuster movies. They have a rooftop cafe that's open during the summer months, 2 bars (you can take a drink into your movie), and a restaurant! *The UW film department hosts free screenings of a wide array of films based on a given theme for that semester through their [http://cinema.wisc.edu/ cinematheque.] Their department has many contacts with other film institutes and are able show rare original 35mm films that you can't see anywhere else. *In late March/early April, go check out some of the many many films showing at the [http://www.wifilmfest.org/ Wisconsin Film Festival.] Sites all over town take part in hosting the showing of these films. *[http://www.fourstarvideoheaven.com/ Four Star Video Heaven] has been voted as a Madison Favorite for a number of years. See their site to browse their collection online. *Our very own [http://music.wisc.edu/ Music Department] hosts many music events. Their website has a calendar listing current music events including faculty concerts and student recitals. *At Memorial Union, there are events hosted by the [https://union.wisc.edu/get-involved/wud/music/ Wisconsin Union Directorate Music Committee] and the [https://union.wisc.edu/events-and-activities/event-calendar/event/behind-the-beat-jazz-series/2015-11-06 Behind the Beat Jazz Series]. *[http://www.madisonsymphony.org/ The Madison Symphony Orchestra] (MSO) is the professional symphony based here in Madison. With your student ID, you can get student rush tickets for as little as $10 per person. *[http://www.wcoconcerts.org/ The Wisconsin Chamber Orchestra] is Madison's professional chamber orchestra. Each summer, their widely popular [http://www.wcoconcerts.org/new/cos/concertsonthesquare.php concerts on the square] draw many people from all over the place for a free outdoor concert. *[http://madisoncommunityorchestra.org/ The Madison Community Orchestra] (MCO) is an informal group run by Madison Area Technical College that meets once a week. There are four free concerts a year and no auditions to play with the group. *[http://www.middletoncommunityorchestra.org/ The Middleton Community Orchestra] is a second newly formed community orchestra run by community musicians. Their concerts are extremely affordable, and they may run auditions. *[http://www.madisonopera.org/ The Madison Opera] produces three operas annually in addition to Opera in the Park. *Outdoor concerts are listed at [http://host.madison.com/travel/local/celebrate-summer-with-madison-area-outdoor-concerts/article_e8b79ce9-34b5-5b82-abda-5c1d00939c36.html madison.com]. *Other events include [http://visitdowntownmadison.com/events/index.php?category_id=5392 Lunchtime Live], [http://www.wil-mar.org/lafete/ La Fete de Marquette], [https://artsinstitute.wisc.edu/memf/ Madison Early Music Festival], [http://sugarmaplefest.org/ Sugar Maple Traditional Music Festival], and [http://summerfest.com/ Summerfest]. *Take a nice long walk along one of the many paths around [http://lakeshorepreserve.wisc.edu/imap/LakeshoreNaturePreserve.html Picnic Point]... bike the path from Memorial Union out to the tip, or bus/drive out to the base of picnic point and wander the foot trails in the area. *Head towards Monona Terrace on Lake Monona, and take one of the paths that wraps around the lake (great bike ride!). *You can also go walking and/or biking around the [http://uwarboretum.org/ Arboretum] south of campus and tour their gardens, or head to the free [http://www.vilaszoo.org/ Vilas Zoo]. Lake Wingra is essentially totally surrounded by wooded areas including Henry Vilas Park, the UW-arboretum and Edgewood college. You can rent canoes at Knickerbocker for fairly cheap and relax on Lake Wingra. *Community Gardens: There are a number of community gardens run by the [http://www.cacscw.org/gardens/ Community Action Coalition]. Nominally, you can sign up for a plot for a small fee, and learn how to garden if you don't already know, or go to town if you already do. The [http://www.eagleheightsgardens.org/ Eagle Heights Community Garden] is open to both residents and non-residents alike. All of the gardens are fun to look at if you haven't ever seen one. *[http://www.olbrich.org/ The Olbrich Botanical Gardens] are located east of lake Monona. Stroll through 16 acres of outdoor display gardens including their award-winning Rose Garden and Thai Pavilion and Garden, or enjoy the year-round tropical Conservatory, a glass pyramid filled with exotic plants, bright flowers, a rushing waterfall, fragrant orchids and free-flying birds.. Outdoor gardens are open daily and free to the public, while entrance to the conservatory is $1 per person. *Catch a festival; Madison is home to a number of festivals -- big festivals, small festivals, arts festivals, music festivals, film festivals, beer festivals -- we've got all kinds. *The city of Madison parks open up outdoor [http://www.ci.madison.wi.us/parks/winterAct2.html ice skating] at Tenney, Vilas, and Elver parks. No skates? No worries. They will rent skates to you there ($6.00 for the first hour, $2/hr after that). *There is also [http://www.ci.madison.wi.us/parks/winterAct4.html cross-country skiing] at a number of Dane county parks, with passes starting at $5/day. No skills? Check out lessons at the [http://www.madnorski.org/page/ Madison Nordic Ski Club] or, again, [http://sns.hoofers.org/ Hoofers] has lots to offer in that area. * [http://www.union.wisc.edu/craftshop/ Craftshop]: Located upstairs in the Memorial Union, they are "here to satisfy your creative urges in a variety of craft media." Their facilities include a darkroom, a woodshop, a ceramics studio, metal working tools, etc. Friday afternoons, they open their studios to all union members (that means you!) for free! * [http://www.hoofers.org/ Hoofers]: Student outdoor recreation club. The Outing and Sailing clubs in particular have lots of graduate students. * [http://india.rso.wisc.edu/ IGSA]: Indian Graduate Student Association. The Memorial Union is located on the lakefront, on Park and Langdon. Be sure to check out the Terrace while the weather is still good -- it's a great place to go to get out of the office, grab something to snack on, and study out in the sun. You'll find the Daily Scoop (yummy ice cream!) and Der Rathskeller (beer and deep-fried goodness). You'll also find all sorts of stuff to keep you busy, like the [http://www.union.wisc.edu/craftshop/ Craftshop], the Union Theater, the Hoofers' headquarters, and a wide array of Mini Courses with which to expand your horizons. Also useful: the travel services center and STA Travel will get you good deals on trips (including bus tickets to O'Hare, Midway, and Milwaukee airports), and the theater's box office will get you good deals on shows (theater, music, etc) all around town. In addition, the Union has always got other special events going on to keep all of us entertained -- see their complete [http://www.union.wisc.edu/activities/ list of activities]. *Paychecks: The first paycheck of the year arrives in October, though you may request an advance on about 30% of your first paycheck when you arrive. If you are not working over the summer, the last will come in June, so be sure to plan for the three month gap. *Fees: You will be charged for segregated fees in both semesters, and are not covered in your tuition. The amount depends on your credit load and status, but will be about $500 for most people and due about the time of your first paycheck. If you are on fellowship, this will be taken care of for you, and shouldn't appear on your bill. *TA union: The teaching assistants of Wisconsin are unionized. Even if you are not a TA, but are an employee of the department, you're still connected to them through advocacy and campus issues. For more information check out the [http://www.taa-madison.org/ TAA]. It's never too early to start studying for [http://www.math.wisc.edu/graduate/quals quals]... early and often, my friends. Early and Often. Definitely check out some of the [http://www.math.wisc.edu/seminars colloquia and seminars]. The earlier you get involved the better. This is a great way to learn more about potential research areas, meet other people in the areas, and meet other mathematicians in other departments. There is a list posted on the 9th floor each week in addition to online. Once a semester, our group for [http://www.math.wisc.edu/~wimaw/ women in mathematics] get together for an informal potluck. We also have been known to bring in women speakers funded by the [http://wiseli.engr.wisc.edu/ WiSELI] grant. This section describes miscellaneous Wisconsin stuff that doesn't belong in any other section, such as, a [[Wisconsin Dictionary]] for those who aren't familiar with the Wisconsin vernacular. *Licenses: As they say on their page for licensing new residents, if you're looking to put your permanent residence here and vote here and generally show up on the radar, you should apply for your [http://www.dot.state.wi.us/drivers/drivers/apply/nonreside/index.htm WI license] within 60 days of establishing residency. Your first baseline license costs $28, and is valid for three years. Note: you will need to take with you, among other things, something like a rent agreement, or a utility bill, UW transcript, or bank statement actually mailed to your WI address (no e-bills). We'll note that math students have been known to wait longer than 60 days to officially apply for residency, but we recommend you don't wait until an out-of-state license expires to get a WI license. *Vehicle Registration: If you own a car and officially become a WI resident, you need to get WI plates. All the information you need is available [http://www.dot.state.wi.us/drivers/vehicles/new/resident.htm here]. *Parking: First, unless you have a motorcycle, '''don't''' plan to park on campus regularly. For parking near your residence, there are some options. Depending on the neighborhood, it's possible to rent a place that has parking included or available for an extra charge. Additionally, if you live in an area surrounded by 2-hr parking [http://www.cityofmadison.com/parkingutility/documents/RP3allmap.pdf zones], you can usually buy a permit (for a little over $20 per year) allowing you to park on the street all day near your home. More information can be found on the City of Madison Parking Utility [http://www.cityofmadison.com/parkingUtility/index.cfm page]. Most importantly, "the vehicle for which you are requesting a permit must be owned by you, your child, your parents/step parents, legal guardian, spouse or registered domestic partner, or be a leased or company vehicle which is assigned to you." Once you've lived here for an entire calendar year, be sure to look into the [http://www.dor.state.wi.us/faqs/ise/home.html Wisconsin Homestead Credit]... it's usually worth the time and effort for graduate students. Until then, you can look into [http://www.irs.gov/taxtopics/tc455.html deducting moving costs] for relocating here on your federal taxes. A warning to students on fellowship: taxes will not be taken out of your paycheck, but you still have to pay them. You may want to consider filing [http://www.irs.gov/faqs/faq/0,,id=199807,00.html quarterly]. We don't exactly get piles of money for teaching. In fact, most people who are not on fellowship or receiving summer funding can qualify for some heating aid (up to $380/year), and electricity aid (up to $285/year). You can check your eligibility at [https://access.wisconsin.gov/ Access WI]. There may be some residency requirements, like the Homestead credit. You can find your annual salary in our [http://www.taa-madison.org/contract/index.html contract]. While it's usually a good idea to become a WI resident, if, for some reason, you're looking to declare residency in WI for tuition purposes, the answer is usually "no." It seems that one has to be in Wisconsin for a full year before enrolling at the UW, and one has to prove that one did not move here primarily for educational purposes (according to the Wisconsin statutes, you have to provide "clear and convincing evidence"). More on that at the [http://www.registrar.wisc.edu/students/residence/index.php Office of the Registrar]'s site. *[http://info.gradsch.wisc.edu/education/gsc/gradguide/index.html Guide to Graduate Student Life]: The Graduate Student Collaborative's ([http://info.gradsch.wisc.edu/education/gsc/index.html GSC]) guide to grad student life in Madison -- like this one, but different. *[http://www.yelp.com/madison-wi Yelp.com]: Find reviews of local stuff- restaurants and things to do, but also dentists, auto shops, etc. *[http://www.vip.wisc.edu VIP], the Visitor & Information Programs office, located in the Red Gym, near [http://www.union.wisc.edu Memorial Union]. They are open M - F 8am - 5pm and Saturday 11am - 2pm. *[http://www.newstudent.wisc.edu Student Orientation Handbook] is a valuable resource for information including entertainment, recreational and varsity sports, student organizations (including those for cultural groups, international students, LGBT students, women, veterans, and people with disabilities), health services, jobs, transportation, safety, and housing. It’s also a great place for referrals to counseling services, including drug and alcohol and sexual assault issues. You can find all this information on the web, at http://www.wisc.edu/visitingCampus/ or call them at 263-2400. You can also email any questions you have to askbucky@uwmad.wisc.edu. *[http://www.lgbt.wisc.edu LGBT Campus Center]: The Lesbian, Gay, Bisexual, and Transgender Campus Center (265-3344; lgbtcc@rso.wisc.edu) provides support, social, educational and research services to the campus community, and serves as UW-Madison's first stop for those looking for information about campus LGBT organizations. The Memorial Union office on the 2nd floor includes a library, a television and DVD player, plenty of comfortable seating, open computers, and has a staff of students and professionals that work to bring events, speakers, and programs to campus. The Center also publishes a weekly events e-letter and offers support and social groups. Counseling services are available through Counseling and [http://www.uhs.wisc.edu/services/counseling/ Consultation Services (C&CS)], located at 115 North Orchard Street, (265-5600, TTY number 265-3300). C&CS offers brief psychological treatment, personal counseling, and psychiatric services to UW-Madison students. Frequent services include help in overcoming depression, managing anxiety and other psychological issues, and in developing greater self-awareness, independence, and self-direction. They also provide personal problem counseling, couples relationship counseling, marriage and family counseling, cross-cultural counseling, and alcohol and drug assessment and referral. Specialized groups have included: graduate women support, women and self-esteem, interpersonal relationships, stress management, survivors of troubled families, rebuilding relationships. C&CS also provides crisis response at the above phone numbers. Services provided are covered by the student health fee (included in your student fees). The administrative and support staff are the folk that keep our department functioning. Without them, we as mathematicians would be lost. :) Their pictures can be found [http://www.math.wisc.edu/~apache/gallery/support_staff.html here] and their contact info can be found [http://www.math.wisc.edu/~apache/gallery/academic_staff.html here]. If one person doesn't know how to deal with a problem you might have, they certainly know who might be able to help you out. Ask them about: Registration (for you and your students), MyUW stuff, classroom assignments. Ask Sharon about: Room reservations (review sessions/exams/other), Copy Center stuff, private tutoring list. 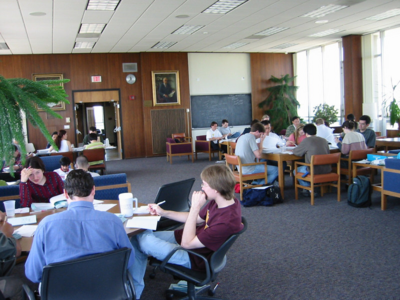 You can find a complete list of current graduate students [http://www.math.wisc.edu/~apache/psdbgrad.html here], and pictures can be found [http://www.math.wisc.edu/~apache/gallery/grad.html here]. Email addresses that end with @ are intended to finish with @math.wisc.edu. Ask Laura about: Anything ... Especially analysis or on campus housing. Ask Nathan about: Pittsburgh, bicycles, and being inferior to Mason at TAing. He dislikes printers and bad margins. Community Car is a Madison-based carsharing company that rents cars by the hour to individuals and organizations. Members share access to a fleet of gas efficient vehicles located in reserved parking spaces throughout the city.